Chapter members celebrated the 75th anniversary of SNP in different ways. Lindsay Brown and Marian Styles staffed a PATC booth at the rededication ceremony for a couple of hours. Meanwhile others were trying to preserve SNP as we have known it. Andy Willgruber and Don Davis revisited Little Calf Mountain to maintain the historic bald. 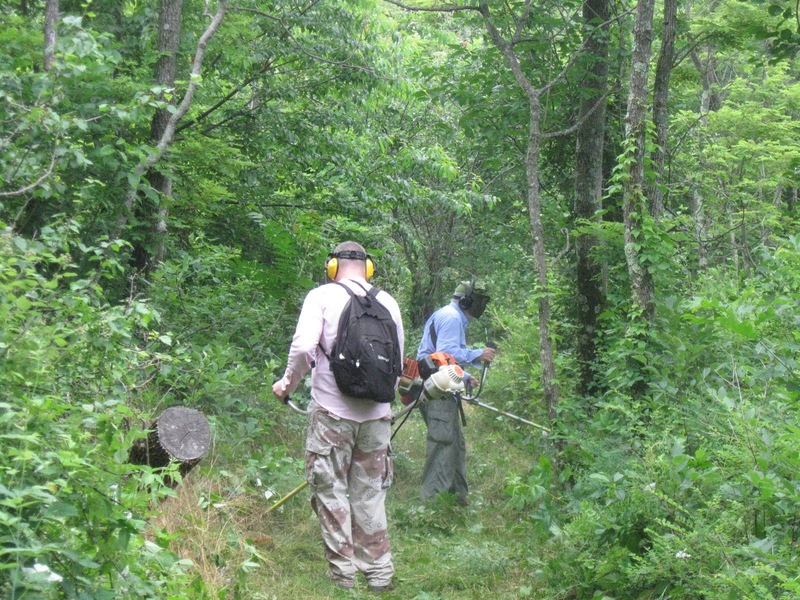 They cleared the access road (the major clearing was done with the help of numerous chapter members starting in 2003), including removing a fallen tree, where Don used his new chain saw certification. They then mowed the open area at the summit, and noted stakes which may be for the new route for the Appalachian Trail, whose new route has been approved. Either clearing the road or mowing the summit can be nearly a day’s work, so this was a lot to do. Then they fulfilled a request to mow the first part of AT from Beagle Gap towards Bear Den Mountain (the tractor seat hill). Michael Seth and I continued cutting back summer growth on the Chapter’s section of AT. My first work trip on this section was about 24 years ago so I thought that showing up was historic. We started at Rockfish Gap so we could clear growth we left the previous month. My newly sharpened swing blades cut through the ground level growth. After a short section, there was little grass growth, so I pulled out loppers to cut the usual small branches and bushes that would become obstacles, especially if wet. We stopped to remove some bittersweet, mostly in patches I had seen before. It keeps growing, but when I thought of what I had seen the previous weekend, I knew we have reduced the amount but not eradicated it. As usual, the many rocks along the trail hinder clearing with a swingblade or weedeater. Perhaps tungsten carbide blades would help. It was a long day but not strenuous. 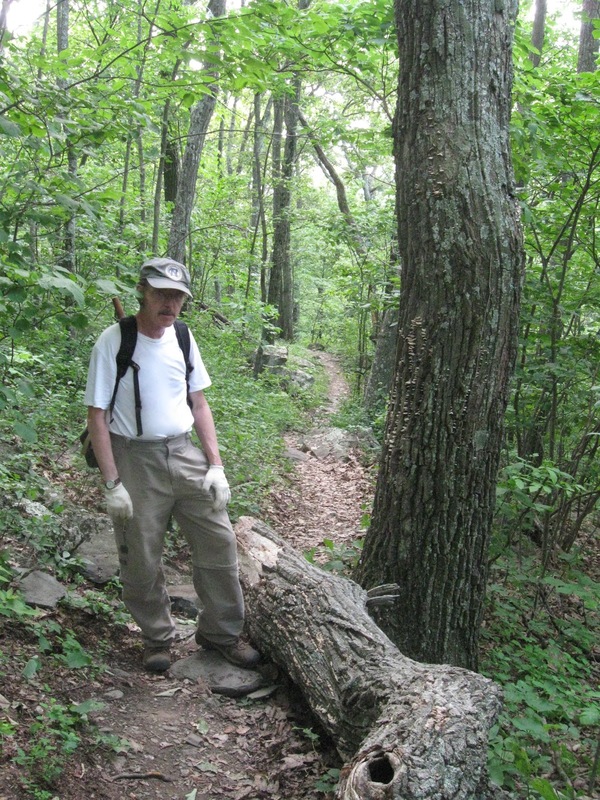 The original plan for the day was rebuilding waterbars, but clearing some overgrown trail near Loft Mountain for an injured overseer was considered more urgent. In one of life’s ironies, I arrived ahead of crew leader Mark Gatewood, who arrives early, because of an exotic species; a felis catus, which invades homes by being cute and affectionate, had a different idea about getting up Sunday morning from humans. On the way, Mark, who was a little behind me, and I saw what he called the wildlife trifecta; a doe and fawn, a bear, a turkey sitting on the rock work on the road side; these sightings, and numerous cyclists, are why the speed limit is 35 m.p.h.. Mark Gatewood, Al Dahler and André Dahler each had a weedeater or brush cutter, while John Shannon, Bette Dzamaba and David Sellers used clippers, shears and loppers to cut small branches and briars above ground. I pulled some bittersweet and ailanthus hoping that they will die rather than be encouraged to grow more. Hikers and backpackers admired our work which was a classic 4 feet wide corridor without grass brushing against legs. Then we could see the trail cupping from heavy traffic and limited drainage. However it was not obvious how to drain this section of trail well. On a previous flight by this crew, one member said that one of the products of BreadWorks was one reason he came. I could not remember which one, so offered him a choice of chocolate or cranberry orange pecan. The goal for the day was clearing about half the trail, much of which we finished by lunch, which was cooler than expected because of clouds. The power tool operators walked on along the trail they planned to clear several days later, while those of us with hand tools walked back the way we came, finding a few more things to cut. The following Wednesday, students from Harrisonburg Valley Ridge Governor's School came to help Mark and Al finish clearing this section. After finishing, I went down the road to Doyles River Trail, and headed up the section of AT we worked on during spring. Our waterbar clearing remodeling, and regrading worked well to stop water flowing down the trail. A section where we repaired some eroded tread looked good. As usual, I saw where we will have to dig out some more, although in some areas, the slope of the land will not allow us to create ideal drains. I did a little remodeling, but saw enough drains to feel confident our work was holding up. I started pulling some of this year’s bittersweet growth, but rain started, and I did not want to get my tools or clothes wet, so headed out to clear laundry baskets, dirty dishes and floors. 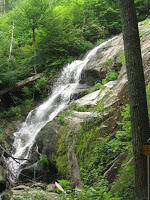 Waterfalls, snakes, and scenic views contributed to make our last hike of spring 2011 memorable. Also, the wonderful people on today’s hike made the day especially fun. Hike leader John Shannon choreographed the 8-mile hike to start at the Montebello Fish Hatchery and proceed to Spy Rock, leaving Crabtree Falls for the end. That route put the harder uphill portion at the beginning of the day when temperatures were cooler and the downhill in the afternoon when we were more likely to be worn out. The views at Spy Rock justified the ascent, and we took a break to enjoy the scenery. Rather than going up for the view, Sue, Leon, and his dog Bailey broke off and did their own shorter hike. 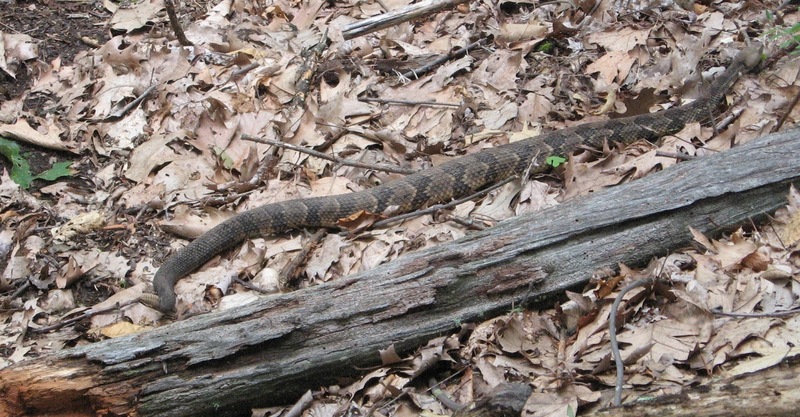 As for the rest of us, excitement unfolded after lunch in the form of two rattlesnake sightings. Rita nearly stepped on the first one—she saw the rattler only when it moved to get out of her way. Before she had even recovered from that scare, Rita had a close encounter with a second rattler just a few yards down the trail. Who can blame her for relinquishing the lead after that? Once we reached the top of Crabtree Falls, the human density factor increased considerably – lots of folks were out enjoying this popular spot. Getting down was easy, though, and we paused to enjoy the viewpoints of the falls during our walk down. After shuttling cars and drivers, Neil, Debra, John, and Marian headed for delicious white-chocolate raspberry shakes at Rapunzel’s in Lovingston, while Briana, Dan, Rita, Nancy, Pete, Bev, and Dave stopped at a quick-refreshment stand for goodies—a fine ending to a perfect day. On a beautiful morning Don Davis and Thomas and Mary Jorgensen and Jeff Van Pelt crawled from under Dunlodge covers to begin tidying the yard. Dirt was moved, paint splatered, gutters cleaned and sticks piled high. Andy Wilgruber appeared and added a very nice switch in to the cottage. Now late night activities in the "Beer Garden" can be lit easily or plunged into murky darkness at the flip of the outside switch. Rita Kiefer came and admired our fire, and helped a bit before Andy saved Don and Rita from long walks by taking them to their respective homes. Don returned in time to greet Dan Ralston and Iva Gillet who dropped in and added many branches and sticks to the flames before heading into the approaching night. Leo the Cabin Cat spent the day sitting around being a cat. The four souls remaining settled in for a fine meal with Mary providing the cooking talent. All world crises were discussed and resolved that evening, unfortunately celebratory beverages were dispensed and everyone woke Sunday with a blank in place of memories of those discussions. The day started with a breakfast to celebrate one of Don’s 37th birthdays. Last minute items such as a curved shower rod were added and the dishes washed and sheets folded. John Shannon arrived as breakfast ended with a single job request. "Kill!" Faced with such determination we bid him well and marveled as he went to work with deadly blades and poisons on alien species he found in the yard. An unwelcome sight were ailanthus saplings, possibly growing from seeds from an adjacent property. Perhaps we can kill them faster than they can grow. Last year’s killing of bittersweet in some areas was a success. After I gave up waiting for people from Charlottesville to join me cutting summer growth along a few miles of Appalachian Trail, I realized that people were reading electronic notifications of chapter activities. Also I was keeping only one person from helping cleanup at Dunlodge, and management of the group would be easy. Michael Seth joined me at Rockfish Gap, where we spoke with a few people on their way to Maine. One of them is an AT maintainer in Tennessee. As we started, there seemed sufficiently few garlic mustard at McCormick Gap seeds to make it worthwhile pulling them; I attributed the small number to the efforts of Marian Styles in May when she removed plants. We also removed some oriental lady’s thumb because at times we thought we were in a small patch or edge of a patch which could be cleared, but this was not the case. Somewhat ominous was the sight of scattered bittersweet plants, meaning it has been spread along the trail. Now I hope that pulling solitary plants early in their life will stop them regrowing. We stopped at a couple of large patches of bittersweet, one where last year I had dreams of major suppression, but there is sufficient regrowth that it would have taken an hour or two to remove this year’s growth. We also questioned north bound hikers about trees across the trail. I had numbers of 0 to 5 and a universal comment that they were not an obstacle. My count was 2, roughly where I expected from one description two weeks earlier. At one we removed a large branch across the trail, but because of equipment, personnel and heat constraints, did not try to cut the 16 inch diameter trunk which requires walking around. Another needed only one cut to get out of the trail. Then Michael said he needed to get home so we did not stop to pull any plants, and simply cut as we walked. A crowded parking lot at Albemarle High made parking interesting and cut hike leader John Shannon's briefing short--so we actually started hiking instead of talking about it. We haven’t hiked Bald Ridge for several years, but notes and memories from past trips and a surprisingly easy transfer of data from one GPS to another helped keep us on the right path. We started hiking near Braley Pond. 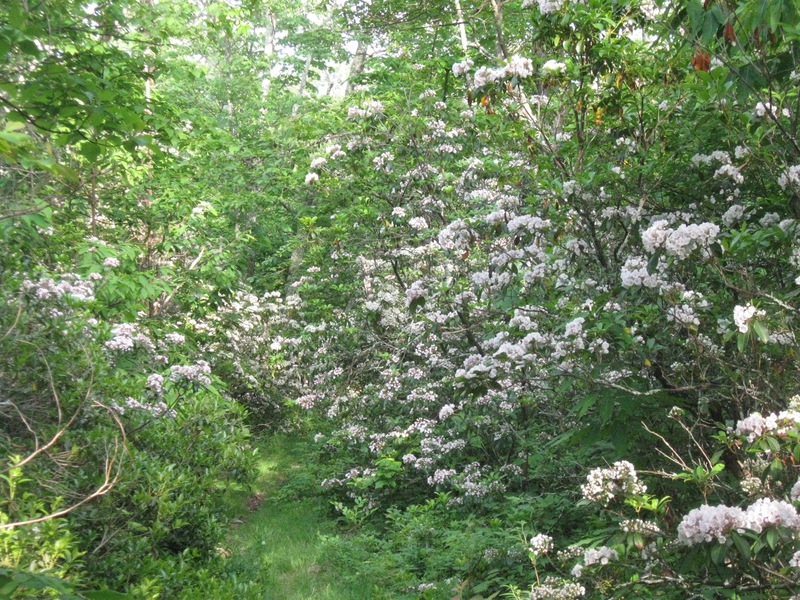 After leaving an old road, we started on a trail towards Bald Ridge, which was surrounded by a spectacular display of mountain laurel in bloom. Wildflowers included a few ladies’ slippers that were mostly past their prime. Wildlife sightings included a black snake spotted by Andy Willgruber. We enjoyed pleasant temperatures early on, followed by the forecasted warm temperature, which was somewhat mitigated by our elevation. We regrouped at the junction with Bridge Hollow trail, whereupon four hikers set off to choose a lunch spot. The other five got hungry before catching up, so two picnics commenced about 200 yards apart. The people eating with John got to have lemon raspberry cake, which helped alleviate one hiker’s pain from climbing. After lunch, we found that one section of trail on the side of a hill was easier to follow than before. Another section was indistinguishable, causing us to briefly lose the trail. The rather long, hot hike resulted in increased water consumption today, and Eric Christenson reached into his sports drink reservoir to supply someone who was running short. From the pond that marks the beginning of a rather steep descent, most people zoomed downhill, while Eric and John followed more slowly with Lara Fine. 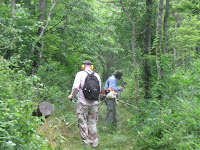 At one point, Eric and John stopped to cut a tree that had fallen across the trail. 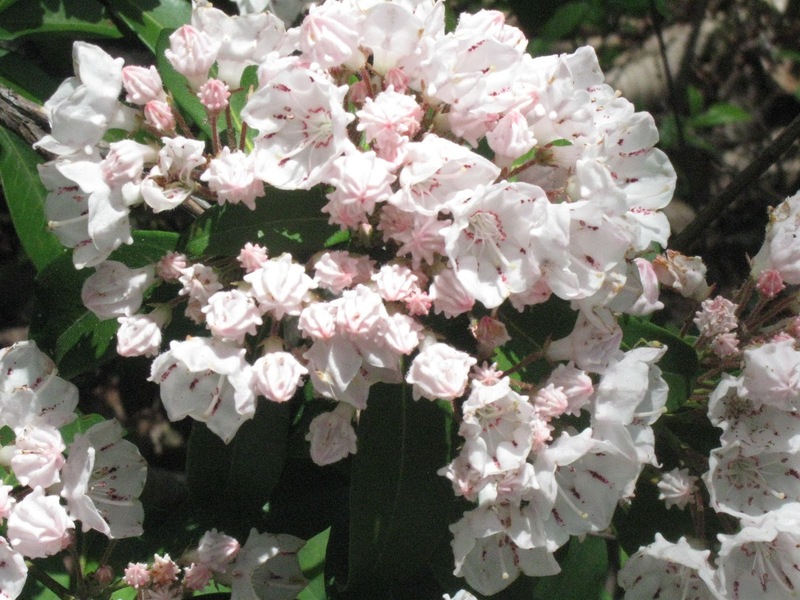 Another stunning display of mountain laurel lined the downhill section of trail. The dazzling flowers helped take our minds off the annoying insects buzzing around our heads. Neil McKinney had the right idea: he came equipped with netting that kept the bugs at bay. 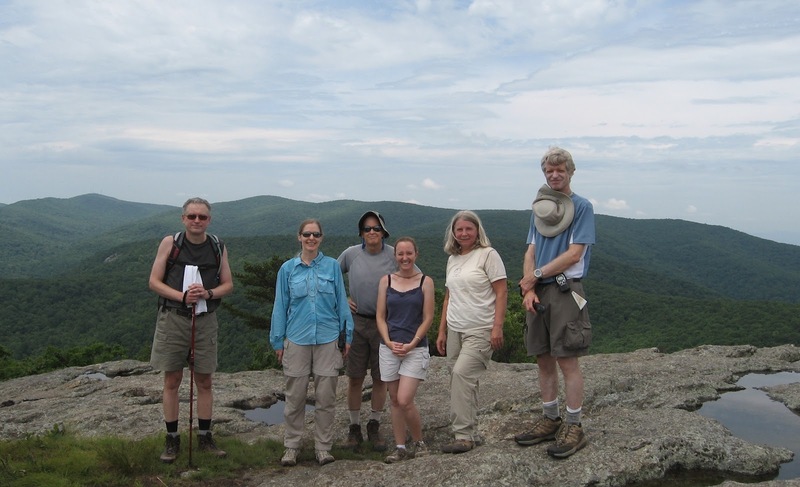 Two-thirds of the hikers detoured at Tastee-Freez on the way home, and no one got back to Charlottesville before 7 p.m. Also on the hike were Marian Styles, Dan Funkhouser, Rita Keiffer, and Wanda Hamlin. On Memorial Day I went to save a short section of Appalachian Trail from damage indirectly caused by humans. Unlike those honored that day, my most likely injury would be poison ivy rash, and I didn’t even get that from the many poison ivy plants. 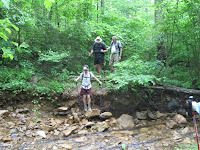 The first task was clearing waterbars and outsloping sections of trail to divert water off the trail. The structures had diverted water and solid material from flowing further down the trail, so there was no obvious erosion, but only one or two were close to self cleaning status. As usual, I did a little extra soil sculpting hoping to improve performance. Then some effort to slow down the take over by foreign invasive plants. I pulled some garlic mustard plants some of which were waist high, and a few oriental lady’s thumb weeds. My efforts were more acts of vengeance than serious eradication. Patches of bittersweet showed signs of previous pulling, which resulted in fresh growth. There were few plants growing up trees, and few thick stems because of past efforts, but a lot of fresh growth. Mostly I merely slowed it down. In some patches further up the trail, I had bittersweet in retreat. Some people on their way to Maine expressed appreciation, because some of them do the same work elsewhere. I spoke to some people heading south, who said the trails are the best they have seen. They reported some trees down somewhere between Rockfish and McCormick Gaps but did not think they were a problem. Later in June with a scheduled trip we should find and remove them. It was too hot and too late for me to go looking. On my way home, I saw a hitchhiker with a backpack. He was on his way to Maine. I only took him to Kroger in Waynesboro. It is the first time I have taken a thru-hiker to town for a trail break. 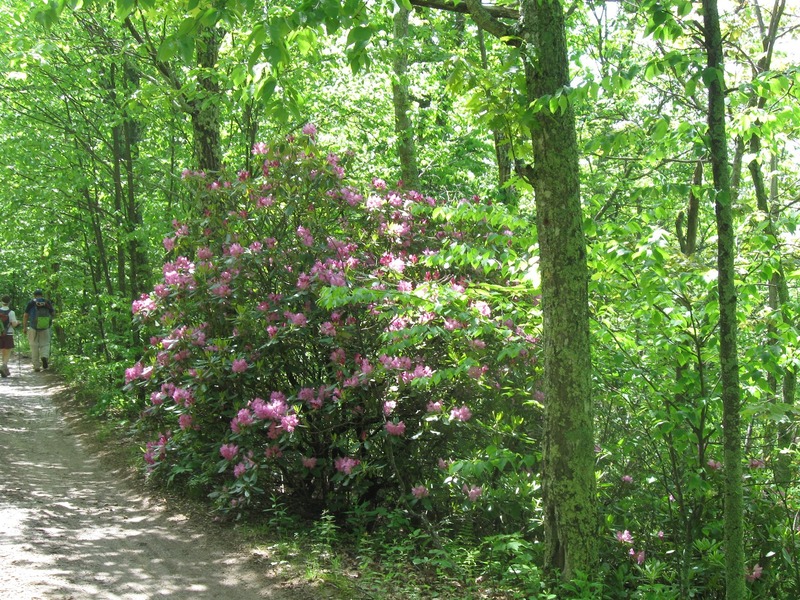 The traditional June rhododendron hike, except it was May, following suggestions that rhododendrons were blooming earlier than normal, so two hikes were swapped. Perhaps others were off holidaying so only nine people showed on a pleasant day, but the parking area at the trailhead had several vehicles. During the descent on Minebank Trail, we saw some rhododendrons, rather than walls of flowers as we see sometimes. Despite a wet month, streams were normal level so we did not have to wade. There were a few drops of light rain, not enough to get out rain protection. The pre-lunch hike was cooler than last year, so no long stops were needed, but I was accused of holding things up by removing legs from my pants. Green Pond had so much water we could not get to the normal edge but looked at it through the bushes. Our lunch included orange pecan cranberry substance, a health food in our book. 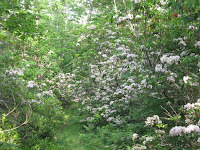 Then on the fire road, we still saw only a light showing of flowers, and some buds, suggesting we were early, and that the traditional first week of June might have a better show. Also on the road, bigger puddles than normal, a large gathering of cyclists, and excitement for some at seeing the old bus left on the side of the road. The last leg, along Bald Mountain Trail, started with three hikers, engrossed in conversation, heading towards Blue Ridge Parkway, but they listened to the suggestion of taking the trail, where we stopped to enjoy the smell of flowering Lily of the Valley. The group today was leader John Shannon, Don Davis, Brad Young, Liz Lyons, Lindsay Brown, Neil McKinney, Dan Funkhouser, Marian Styles, Debra Fisher.